Does the Hypothyroidism Revolution work for ______ ? B. No thyroid or had RAI Treatment? The short answer to all of the above is “Yes”. A: Will this still work if I suffer from Hashimoto’s thyroiditis? Hashimoto’s thyroiditis is considered the most common form of hypothyroidism today (and for good reason), which is why we’ve designed the program to address the underlying issues that cause Hashimoto’s. With Hashimoto’s there is both a hypothyroid and immune component that need to be addressed and it’s driven primarily by your inability to regulate estrogen. Estrogen directly blocks your thyroid gland. It can cause the thyroid to over-produce thyroid hormone while blocking the proteolytic enzymes that allow the release of stored thyroid hormone into your bloodstream. Estrogen is also very well known for causing damage to the thymus gland and causing an increased risk of Hashimoto’s and other auto-immune conditions. The good news is that once you correct the metabolic dysfunction and your body’s ability to regulate estrogen, the thymus gland can heal and help restore proper immune function. And this is a big part of what we focus on in the program. B: Will this still work if I have no thyroid or had RAI Treatment? Yes it will… and if you’ve had your thyroid removed or treated with radioactive iodine then this is extremely important for you to understand because you won’t hear this from doctors. Everything we teach in the program still applies 100%. The only difference is that you will need to supplement thyroid hormone to the degree that your body cannot produce it. However, it’s important to understand that just because you take thyroid hormone doesn’t mean that the hormone is getting to your cells or that you’re able to use it. Your thyroid health involves more than just your thyroid gland. You can supplement all of the thyroid hormone you want but if your thyroid hormone pathway is blocked (which it almost always is) and you can’t get the hormone to your cells then you will still remain hypothyroid. In the program we work to unblock your entire thyroid hormone pathway. Ready to take control and address your entire thyroid hormone pathway? C: Will this still work if I have food allergies? A resounding YES… and you need to know that food allergies are one of the most misunderstood health topics today. If you’ve been led to believe that food allergy testing and food avoidance are the solution, then you’re in for a long and bumpy ride. The truth is food allergies are caused by digestive leakiness due to a lack of thyroid hormone, energy production, and dysfunctional metabolism of the cells that line your digestive tract. When unable to properly energize, these cell membranes become weakened allowing undigested food particles to permeate directly into your bloodstream. By regulating your thyroid and metabolism, and restoring energy production to your digestive tract, these cells will regain their rigid structure and food allergies will resolve. 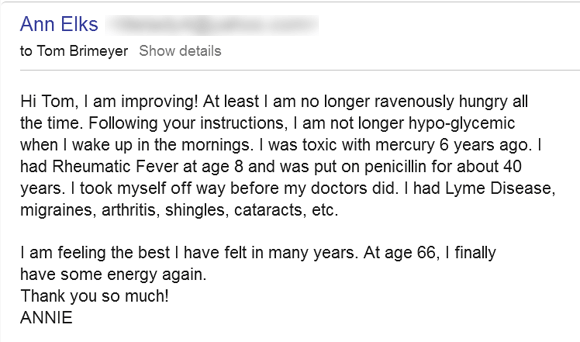 Many of our clients report not only significant improvements in digestion but also food allergies that have resolved just like Linda who overcame her lactose intolerance using the Hypothyroidism Revolution. D: Will this still work if I have other health issues? It’s important to understand that every cell of your body relies on thyroid hormone to perform its function. Your organs including your heart require adequate thyroid hormone and as per the work and research of Dr. Broda Barnes we understand the direct connection between hypothyroidism and heart disease today. Diabetes is commonly found together with hypothyroidism because of metabolic dysfunction. In fact, anyone who is diabetic will also be functionally hypothyroid. This is something that we need to fix in order to also fix the underlying thyroid condition. Without adequate thyroid hormone, your digestive tract becomes dysfunctional which can contribute to IBS and other digestive disorders. Without adequate thyroid hormone, your entire immune system is affected resulting in an increased risk of auto-immune disease of many natures, including arthritis. Few if any of our clients come to us with their only health concern being hypothyroidism or Hashimoto’s. Yet, in most cases these other health conditions are directly related at some level to their hypothyroidism. We’ve seen and worked with a large number of health conditions, so if you have other health concerns then odds are we’ve had experience with it in the past. And we offer free email coaching as a bonus to help make sure you’re on the right track. If you still have concerns, feel free to email us. In some rather serious cases, we do required involvement of your doctor for proper monitoring while adjusting to the program. Most often our clients have multiple health concerns like Annie and see significant improvements in most if not all of them. We’ve really put a lot of time and effort into designing the Hypothyroidism Revolution program to address every single one of these concerns. It was never our intention to create a program that will work for some and not others. 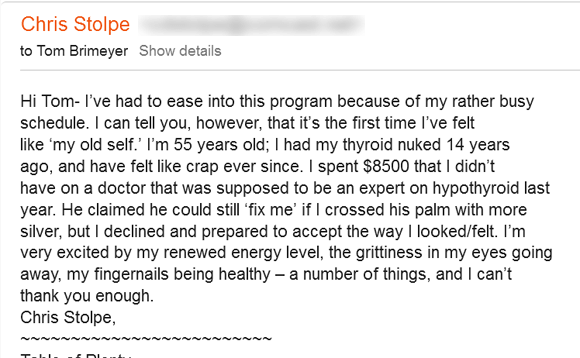 It WAS our intention to create a program that addressed all potential thyroid issues and that can work for anyone. And that’s just what we did. And the success story emails you’ve read here in this email are just a few examples of the hundreds that have proved just that. 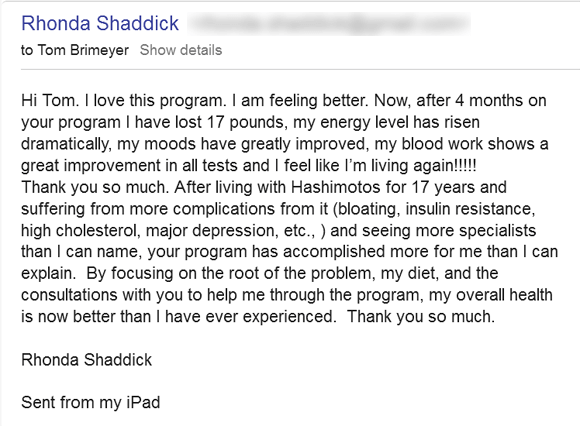 So again, YES, the Hypothyroidism Revolution works… and it will work for you. Are YOU the next success story? !